Maksun Biotech Pvt. Ltd. is an ISO 9001:2008 and GMP certified global pharmaceutical company with involved in the areas of product marketing & manufacturing. Our focus on specialty segments in India and simultaneous opening of newer markets abroad will help us achieve a niche in global pharmaceutical arena. We are firmly establishing our brands in each market for sustained growth. Maksun Biotech has established strong capability of providing latest formulations & will always be one step ahead. Maksun Biotech was incorporated in 2010 but has since established itself as a vibrant marketing organization & now proudly is one of the leading pharmaceutical companies in India. The Company is backed by a team of professional's takes complete responsibilities & dedication in Human Health Care. We provide health care solutions in various therapeutic segments with specialized focus on Analgesics, Antibiotic & Anti-Infective, Anticold & Antiallergic and Antipsychotic Drugs. Apart from these, our range also includes Cardiovascular Drugs, Gastro & Antiemetic & Anti Ulcerant, Haematirics, Hormones, Neurology Supplements and Nutritional Supplements. The unique and inseparable part of Maksun Biotech Pvt Ltd is its highly professional and experienced workforce, which is committed and accountable. The team ensures flawless productivity and supply of the products and services. Our progressive organization is a result of our tremendous team efforts, dedication and responsibility of the workforce. We are supported by a highly competitive team of experts for which we have been able to make an unrivaled position in the industry. Being a client centric organization, we observe ethical business policies, which make us a reliable and trusted business associate. Our emphasis on achieving complete client satisfaction is fulfilled through our vast experience and state-of-the-art Maksun Biotech. Our professional approach has enabled us to garner clients from all over the country. Further, we are also lay emphasis on maintaining timeliness in all our consignments. 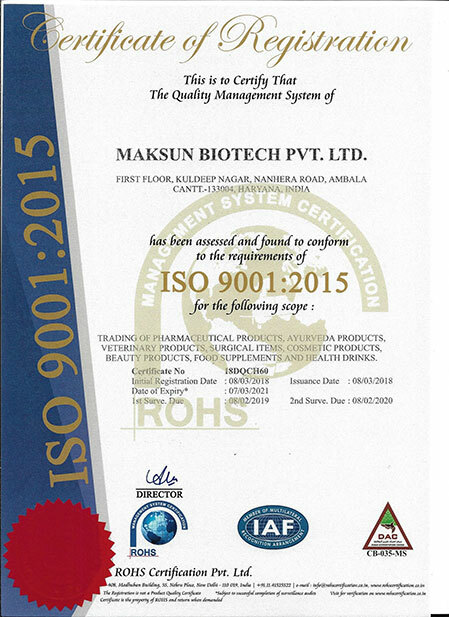 We at Maksun Biotech have certain quality parameters designed as per the requirement of ISO 9001:2008 and is also ISO 9001:2008 certified company. Our quality management system covers all the sections of manufacturing to its distribution .This system defines all the criteria required for the effective operation and control of the processes and their documentation. Maksun Biotech is completely certified pharmaceutical company. We work ethically and approved by regulatory bodies. Our Company ISO 9001:2015 certified pharmaceutical company which has its own manufacturing facilities. Our laboratory is confirming international stands and manufacturing unit is WHO and GMP certified. The raw material for our products is sourced by the certified vendor in the Industry. Why Should You Invest in PCD Franchise Business? How Much Investment is Required to Start PCD Pharma Business? What are the Requirements to Take PCD Franchise of Pharma Company? How to Get Profit Margin in PCD Franchise Business? What Should Be Considered While Choosing PCD Pharma Franchise Company?